So many people are conscience of the dark spots on their hands, legs and face. There is now reliable technology that can remove those spots to make people feel better about the way that they look. By taking part in outdoor activities, you’ve taken care of your spirit. But, while enjoying an active lifestyle, it’s easy to forget just how important it is to take care of your skin, such as wearing a sunscreen of at least SPF 30 and avoiding the midday sun. Even when you take precautions to protect yourself from the harmful effects of ultraviolet (UV) light, eventually most everyone – men and women alike – will have to contend with photo damaged skin, and in-turn the skin gets dark spots. In fact, over 90% of the signs of premature aging are sunlight related. We see it in men and women as young as 20, although photo aging is most apparent in those approaching an older age. The signs of sun damaged skin includes thinning, fine lines and wrinkles, uneven pigmentation, roughness, broken blood vessels and brown spots. Serving North Houston, North Houston Laser Tattoo Removal is on the forefront in Texas in the use of noninvasive lasers, light and energy to reverse the signs of aging and to restore the health, appearance and overall well being of your skin. 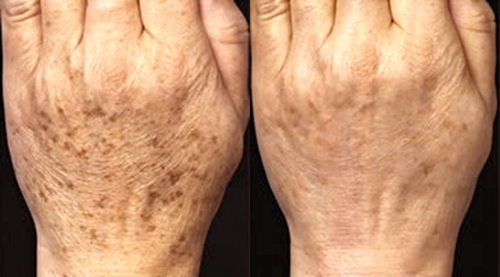 Although associated with aging, lentigines (brown spots) are actually your body’s attempt to protect itself from overexposure to the sun’s ultraviolet rays by overproducing melanin. Also known as liver spots and sun spots, this form of hyperpigmentation can persist on exposed areas of skin such as on the face, neck, shoulders, chest and arms and appear in a variety of colors ranging from dark yellow or brown to black. Broken blood vessels aren’t broken at all, but rather dilated. The result of genetics, extreme heat, spicy foods, strenuous exercise, excessive alcohol consumption, anxiety or overexposure to the sun’s UV rays, enlarged capillaries show themselves on the face, neck and upper chest.